ALL courses are POST certified or certifiable! Specific details are provided on additional information page for each course. Consistently rated as the best program of its type in the world today and is ONLY presented to Criminal Justice Employees. Throughout this program participants are introduced to a scientific and systematic approach in which the mission of gathering and evaluating data is focused on the process and not the person. The objective throughout the program is to respect the dignity of all people while safeguarding the constitutional and civil rights of all parties. The source of communication, the subconscious mind, is identified and students are instructed as to the power the mind possesses in sending out mixed signals and overcoming ulterior motives. Linguistic research by such theorists as Eric Berne, is discussed to illustrate this concept. Definitions are provided outlining the similarities and differences in the information gathering process. Individual biases and prejudices are discussed and their impact on the quality and quantity of information is presented. The participant's communication style is identified through written examination and class discussion. This style is then presented in the context of identifying other individual's communication needs and wants. Steps to meet these critical areas are highlighted. From this information major theme building for persuasion is presented and how it might be used to gain the acceptance of the suspect in confrontational interaction. The twenty-six mental defenses that humans employ to escape guilt or responsibilities are defined and discussed. The six most commonly used mental defenses in criminal cases are identified and steps to overcome these defenses are outlined. The five emotional responses of humans are identified and techniques to overcome them articulated. Exercises conducted to show how to manipulate individuals from one emotional response to more productive areas are completed. An A-Z approach is utilized to reacquaint the experienced investigator with information gathering and to introduce the material to new investigators. The students are given information that identifies the basic considerations present in an effort to gather information and to evaluate it in a professional and unbiased manner. Students are encouraged to examine these cornerstones of the process in an effort to avoid costly errors in the obtaining of critical information and it’s use in the criminal justice process. Interviewing witnesses, victims and cooperative individuals is examined in this review of the steps and procedures utilized in the information gathering arena. The focus shifts from gathering data to identifying guilty or involved parties. 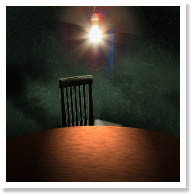 Interrogation is defined as a scientific operation and steps for successful interrogations are outlined. The physical mechanics of this process are examined regarding location, people, and physically inhibiting characteristics of the individual. The formation of questions and the manner and order in which questions should be asked for greatest impact is discussed. Question types and rules for use of each category are outlined. Examination of the communication process begins with the analysis of the spoken word. Students are trained to recognize the verbal indicators of deception and how word tense and usage can be used in the evaluation of the reliability of individuals' statements. Exercises including the evaluation of suspect’s statements including O.J. Simpson’s are completed by class members. The communication process examination continues with the introduction of non-verbal communication. As the majority of communication utilized by humans, this important arena is broken into specific gestures that suggest emotional responses during the interview or interrogation process. The reason humans utilize body language and the Principles and Rules that apply are highlighted. The use of the three representational systems employed by the human subconscious is discussed in relation to rapport building (the interviewer is aware of what is happening while the interviewee most likely will not be). The significance of this technique is presented so that investigators might gain the most information possible from individuals. This technique is very beneficial in interviewing child victims or those suffering from traumatic experiences. Practical exercise included. An extremely accurate and reliable technique to determine the truthfulness of an individual is presented. The appropriate use of this information is presented to the student so that deceptive or uncooperative statements may be recorded or challenged as the situation dictates. The use of hypnosis is demonstrated as a means of taking some of the principles found in this science and applying them to the role of relieving negative emotions in witnesses and victims during the interview process. The gestures of openness, receptiveness, doubt and defensiveness are discussed. The student is introduced to the technique of mimicry and how their posture can inhibit the flow of communication. Additional gestures of deception and control are introduced. This lesson is highlighted by the non-verbal indicators of nervousness, frustration and protection. Each area is shown to the students and discussed. To close the segment on non-verbal communication the gestures of superiority, indifference, boredom and interruption are shown to the participants. The measures that should be employed to counter these barriers to communication are discussed thoroughly. The use of territorial spaces and zones are discussed. Proxemics are demonstrated and the drawbacks and benefits of using space is discussed. The ability to create a positive or negative environment through the use of space awareness is also highlighted in this block of instruction. Common communication themes are discussed with the students and the use of such verbal devices to initiate dialogue are illustrated. The student is trained to use a given theme or to employ alternate openers and ice-breakers. Techniques to assist in rapport building from a conscious perspective (both the interviewer and interviewee are aware of what is occurring) are covered. Appropriate use of these techniques to create a positive or negative environment is stressed. Practical exercise included. Students participate in structured evaluation of interviews and interrogations in an effort to apply the accumulated material of the course. The course concludes with video examination highlighting the material covered over the preceding hours. Students are shown different videos and asked to determine, and to articulate, the relevant points of information and to identify deceptive statements and actions. A written test is administered to satisfy course learning objectives have been met.